Heizomat Canada is a family owned business based in Breslau, Ontario, Canada and consists of a sales & support team dedicated to serving the North American market. We are an official supplier of German engineered and manufactured Heizomat heating systems. “Energy in Balance with Nature” has been the guiding principle of Heizomat GmbH since the founding of the company in 1982 by Robert Bloos in Maicha, Germany. It is a family owned, community oriented business with a passion for innovation, efficiency, craftsmanship and quality. Robert Bloos built the first automatic discharger system for woodchips in 1982. The idea behind it was to use wood from his own forest with the same comfort as he would fossil fuels. 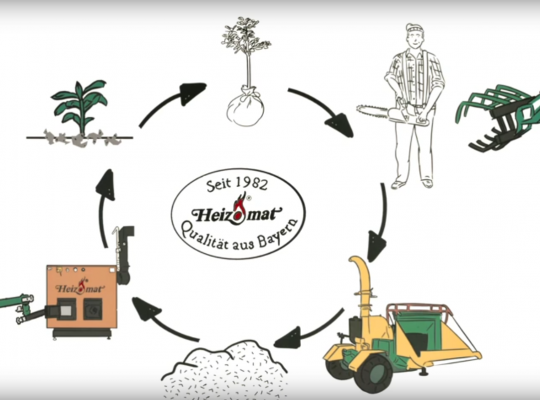 In the beginning the discharger system was only to supply the boiler with woodchips for his own agricultural business, yet more and more people showed their enthusiasm for the “Heizomat”. Today Heizomat has more than 200 employees including a large training workshop with 14 apprentices in the two Bavarian towns of Gunzenhausen and Maicha as well as Heidenheim in Central Franconia. The production area has developed from a garage to today’s size of over 35,000m². As well as automated boilers systems for woodchips and biomass, Heizomat has specialized in the construction of hand and crane operated chippers, filling technology for woodchip storage, woodchip transportation systems and grippers for trunk and treetop wood. When you walk through the offices and manufacturing plants of Heizomat you notice the beautifully designed and informative displays, the passionate and knowledgeable staff, the apprentices and highly trained, skilled workforce and the high quality original materials. In addition to this you find the owners and leadership closely engaging in cutting edge research projects and deeply involved in quality control. This is old school manufacturing combined with innovative, modern technology and ideology. Thanks to their innovative ideas, numerous patents and rigid commitment to quality, Heizomat have enabled tens of thousands of companies, farmers and private households to meet their energy needs simply, efficiently and cost effectively using renewable raw materials instead of fossil fuels.